We are back! For the forth year EOUC, the community of EMEA usergroups is hosting an ACE short talks session at OOW. 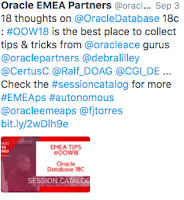 We decided on 18C database tips, but with OOW moving to a week earlier a lot of rework was required by the OOW organisers to get everything in and it hasn't been possible to have a User Group Sunday. They have however included a smaller number of user group sessions in the main agenda. EOUC agreed we would have to limit this session to a single time slot and not the double we normally use and already submitted. 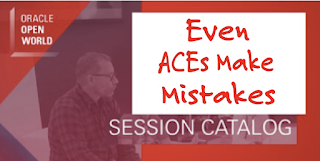 The ACEs who signed up to take part decided it would be better to have a more light hearted topic as we didn't know when in the week it would be and we normally use the talks on the Sunday to set you up for the full agenda. Tim Hall suggested the topic be our mistakes and everyone was quickly onboard. Then before I could update the session Oracle started marketing it and this was all over twitter. Sorry if you were excited by that, but this will be equally great. Lessons learnt the hard way are the ones you remember. Even I am going to take part this year, not just facilitate, after all you don't have to be technical to screw up! I always say this session is the one that takes the most time to prepare. Herding ACEs is a very under rated skill. Jennifer and Lori I salute you. Once I got enough signed up, then I needed their topics. I asked for a short sentence and a single word heading. Difficult question? I didn't think so, but they seemed to think a hashtag type, concatenated title work; so I'll go with that. 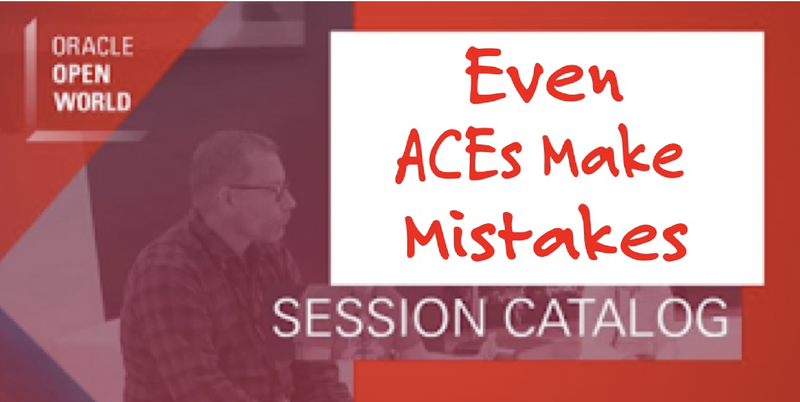 Each of the speakers will write a blog about their mistake which will be published on the day, and I'm thinking of asking all ACE Directors to contribute a blog and make them available in a pdf book - what do you think? The session is on Tuesday afternoon, please come along and please add it too your schedules so you don't forget.